Travelling with children can be a little hard work – especially when trying to cater for everyone and of different ages. That’s why we’ve put together our Top 5 Things to do with children in Queenstown for guaranteed fun, laughter and a good night’s sleep afterwards. This is an absolute must with (or without) kids! The views from the top of Bob’s Peak are absolutely breath-taking – a great opportunity to get the perfect panorama of Queenstown. The Luge is a great family activity – race each other down the scenic tracks with the backdrop of Lake Wakatipu and The Remarkables in your photos! Once finished competing one another, take a break in the café and pick up some sweet treats from the Jelly Bean store. Skyline also offer a delicious buffet lunch/dinner, Star Gazing and a tradition Haka show for anyone wanting to learn a little more about Maori culture. Set at the bottom of the Gondola, this is a great activity for the family. 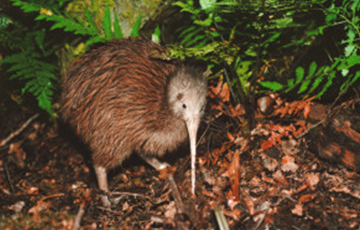 Learn and see native New Zealand birds and species from the Kiwi Bird to the Tui to the Auckland Green Gecko! With daily feeding sessions, conservation shows and a Forest Walk, this is the perfect combination of education, conservation and entertainment! 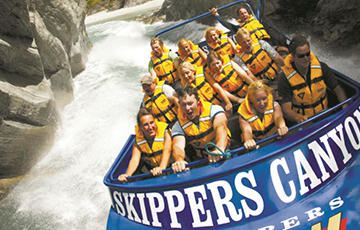 Queenstown is synonymous with Jet Boating – a thrilling, exciting and adrenaline filled activity for the whole family - Skippers Canyon Jet doesn’t disappoint! Take a tour through Skippers Canyon (an old mining Canyon) and learn some fun facts about the Gold Mining History of Queenstown. Infamous for being one of the most ‘dangerous roads’, this trip is a great way to experience the excitement from the comfort and safety of the tour bus with fantastic commentary along the way. Once arrived, jet boat through some of the narrowest points of the Shotover River and enjoy the thrills of 360 degree spins! After a busy day around Queenstown, why not head to Minus 5 Ice Bar and experience a bar completely made of ice! The walls, the tables and chairs – even the glasses are made of Ice! Don’t worry you are provided with big thick coats and gloves to keep you warm for this surreal yet fun experience! Enjoy the artistic Ice carvings and try different drinks for a chilly afternoon treat! To find out more about things to do in Queenstown, please get in touch with our Reception team, who have first-hand experience and vast knowledge of all Queenstown activities. 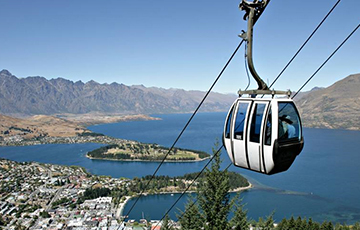 For the ‘Adventure Capital of the World’, Queenstown truly never sleeps! Activity providers, restaurants and bars offer their experiences every day, 365 days a year! We’re so lucky to be able to have an adrenaline filled morning Bungy Jumping, followed by a Lord of The Rings Tour in Glenorchy in the afternoon and a great night out on the town in the evening – but what do we locals suggest for some much-needed down time in Queenstown? Coffee, Cake (and more Coffee! )That’s right – Queenstown has a fantastic Coffee and Café culture, with dozens of different local businesses offering a range of experiences. 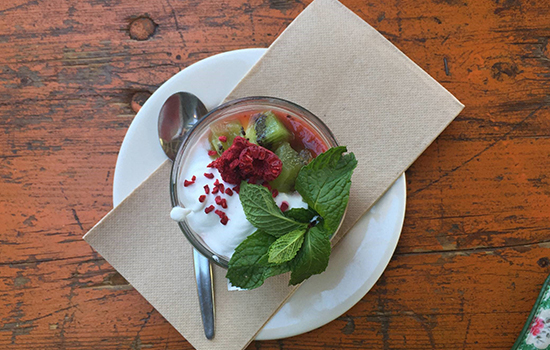 If you like a cosy atmosphere, with fantastic Gluten-Free, Dairy-Free/Vegan or raw treats on offer - then get yourself to Bespoke Kitchen on Isle Street! Fantastic coffees, a wide range of breakfasts, salads and cakes and a great view of The Remarkables from their deck, this truly is the place to visit for your Sunday morning brunch! A Cruise Wine Tour Central Otago has been claimed to offer some of the best Pinot Noir in the world and what better way to spend a day visiting the ‘Valley of the Vines’ to find your favourite unique flavour complimented (of course) with some fantastic cheese boards. There are many tour operators in the area who can pick you up from Pounamu Apartments and chaperone you to various wineries, allowing you to sit back, relax and soak in the views and vintages! A great way to spend a cruise Sunday afternoon with some friends! A Leisurely Boat Cruise on Lake Wakatipu You can’t come to Queenstown and not sail across the magnificent Lake Wakatipu! The third largest lake in New Zealand spanning over 80km long (and deep enough you can hide the Eiffel Tower in!) it is a must do! Why not board the TSS Earnslaw? 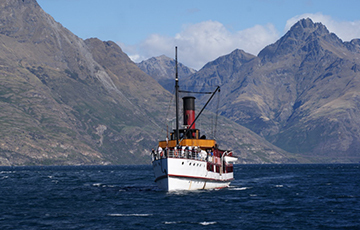 Built in 1902 she is aptly named the ‘Lady of the Lake’ – an iconic Queenstown experience! 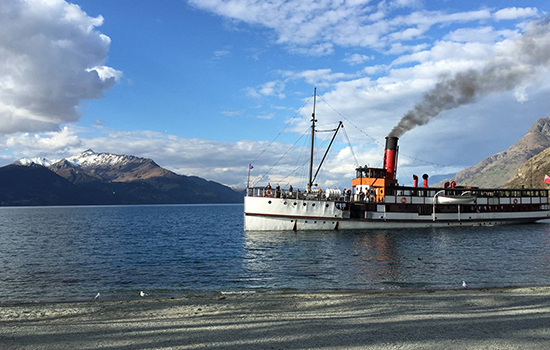 This traditional vintage steamship offering plenty of history is a great way to get a different perspective of Queenstown. A (short) Hike up Queenstown Hill A popular with visitors and locals alike, the short 45 minute walk up to Queenstown Hill (from the Carpark on Belfast Terrace) is a little more strenuous climb than a stroll around the gardens, but it will reward you with an incredible panoramic view of Cecil Peak and The Remarkables. Don’t forget to sit in the ‘Basket of Dreams’ and snap a photo of that epic view! Cosy afternoon in at Pounamu Apartments Sometimes after a crazy, adrenaline-filled week Bungy Jumping, Skiing and Jet Boating you just need an afternoon chill-out! Why not take a dip in our outdoor heated spa pool and watch the world go by with fantastic lake and mountain views, followed by getting cosy in front of our gas fires with a glass of red wine and your favourite movie on the TV. Superb! Gives you chance to relax, find your Zen and be ready for another action packed day tomorrow! To find out more about our apartments, why not get in touch via enquiries@pounamuapartments.co.nz or give our receptionist a call on 034424868 who can certainly recommend help organise any trips and activities you’d like to do next time you’re in Queenstown. My personal favourite is Milford Sound. Whether you are flying, driving or by bus, Milford Sound is spectacular all year round. Mitre Peak is just stunning when covered in snow. Milford Sound is just a photographers dream and one of my favourites.. check out the photos. If flying I tend to book with Air Milford, great if you only have a small window of time – sit back and relax and let the Air Milford team look after you! Pickup & return to Pounamu Apartments. Allow 4 ½ hours which includes flight to and from Milford and a cruise which includes a lovely buffet lunch or complimentary afternoon tea on Southern Discoveries. It’s a small boat with a capacity of 150 people. The flight over is so pretty especially in Winter/Spring the snow-capped mountains are just so dramatic. Flying to Milford Sound allows you to see into the blue lakes and view the waterfalls and mountains from a comfortable view flying out to Anita Bay . The pilot points out all the hot spots too. The environment is pristine and unspoilt, bound by steep cliffs, dense rainforest, ink-dark waters and gushing waterfalls. Air Milford are #1 on Trip advisor and I would have to agree it is one of the best tours on offer. Despite its name, Milford Sound is actually a fiord, not a sound. It is the only fiord in New Zealand that is accessible by road. The scenery is awe inspiring with prolific flora and fauna. 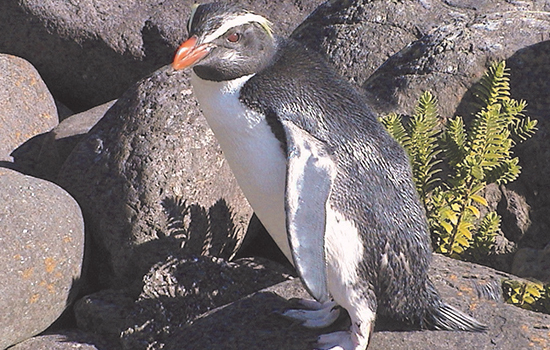 The yellow eyed penguins are so beautiful (take your long zoom lens) and we even got to see seals basking on the rocks and bottlenose dolphins. Milford Sound is famous for its waterfall. Stirling Falls is stunning and if it has been raining it’s even more spectacular. The boat nudges right up to the base of waterfalls - it is waterfall heaven. The cruise takes you out to the point where the fiord meets the open sea. Legend has it that at Anita Bay this was where Maori collected their sacred Pounamu or Greenstone, once prized for making tools and jewellery. Driving to Milford is a long day .. very tiring to be honest. I find by going on the coach, you get to see more (pure luxury with purpose built glass roofed coaches), hassle free (pickup right outside Pounamu Apartments) and you get to fall asleep on the way back to Queenstown. Real Journeys is my pick of the bunch for the coach cruise. I went on the Nature Cruise but there is the Scenic Cruise for those wanting mandarin speaking commentary. 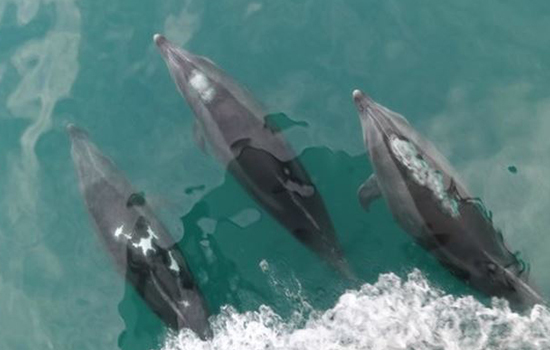 The nature cruise is 2 ½ hours with the coach ride a good 4+ hours one way. I ordered the picnic lunch which is yummy and when the coach stopped at Te Anau, I got coffee and nibbles. So the day trip is amazing. Better still, if you really want to see the fiords at their best and be woken up with the Tui’s singing, then do an overnight cruise with Real Journeys. In the evening you can go kayaking. The 3 course evening meal is fit for a king with a licensed bar and in the morning it’s a lovely continental breakfast. The nature guide commentary is so informative and you get to find out about the history, fauna and wildlife. Once anchored I chose the small boat trip out in the evening instead of the kayaking as I had my expensive camera and we got some lovely images. Well worth it whichever way you choose to go .. I enjoyed all the trips and can’t wait to go back.